Almost everyone has gotten a cold and learned how it can cause difficulties in breathing. The body makes a great amount of mucus to flush dust and germs out of the lungs. For most of us, a cold is only uncomfortable for a short time, but for those with cystic fibrosis, it is a daily struggle to breath. The mucus caused by cystic fibrosis is thick and sticky. “If you have cystic fibrosis, your mucus becomes thick and sticky. It builds up in your lungs and block your airways. builds up and causes problems in many of the body’s organs, especially the lungs and the pancreas.” According to the National Institutes of Health, National Heart, Lung and Blood Institute, “the build up of mucus makes it easy for bacteria to grow.” Not only does this build up lead to lung infections, if can also lead to digestive issues (malnutrition) because the mucus can block the ducts of the pancreas which creates enzymes that help food digest int he intestines. 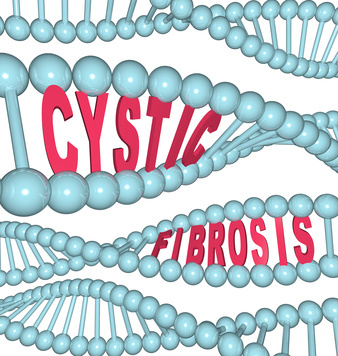 Cystic fibrosis is an inherited disease. Both parents must be carriers of the faulty gene for the child to develop cystic fibrosis. All states test for cystic fibrosis during newborn screenings. The screening includes a type of blood test which looks for the gene associated with cystic fibrosis (the CFTR gene). That blood test also demonstrates whether the infant’s pancreas is working properly. If the blood test indicates the presence of cystic fibrosis, the physician may order a sweat test to confirm the diagnosis of cystic fibrosis. Other tests my include a chest x-ray; a lung function test and or a sputum culture. Even though there is no cure for cystic fibrosis, there are a number of treatments which can lessen the symptoms. These treatments include pulmonary rehabilitation, exercise, different medicines, oxygen therapy and nutritional therapy. Because cystic fibrosis can also cause a special kind of diabetes, that will be treated too. The Commissioner of Social Security has “listed” cystic fibrosis as a disease which can cause disability. Social Security has taken notice that cystic fibrosis “is a disorder that affects either the respiratory or digestive body systems or both and is responsible for a wide and variable spectrum of clinical manifestations and complications.” In order to qualify for Social Security Disability on account of cystic fibrosis, a person must first satisfy the Commissioner that the correct diagnosis has been made and second, prove that the cystic fibrosis is at such a severe stage that it causes certain restrictions which Social Security believes are incompatible with work. The diagnosis must be made by a sweat test. Once the diagnosis has been confirmed in that way, the disease must be accompanied by the presence of chronic obstructive pulmonary disease, or insufficiency of the exocrine pancreatic function, meconium ileus or a positive family history. Regarding the pulmonary part of cystic fibrosis, it must be evaluated under 3.04 of the listing. Regarding the nonpulmonary aspect fo the disease, which is the digestive portion that must be evaluated under section 5.00 of the listings. Even if the listing part of the analysis is not meet, it still is possible to qualify for Social Security disability benefits if your physician has restricted you from doing what normal workers do in the work place. If you would like to discuss your Social Security Disability case, give me a call, Indianapolis Attorney Ted Smith, 317 280-8863 or just complete the contact form and I will call you!